This entry was posted in General Political Science and tagged 2014, Midterm Elections, Voter Turnout, Voting. Bookmark the permalink. There is about a ten percent drop in voter turn out for the midterm election verses the presidential election. I believe that people do not pay as much attention to the midterm election and do not consider it to be as important as the presidential election every four years. I think the election will be at about forty percent as the average for the midterm has been for the past few decades. i feel like that many people don’t keep track of who is running and think that the presidential election is more important. I also feel like that for the midterm election many people don’t care about who is running. I feel like the midterm election this year is going to be a little more than usual because you could register to vote and vote the same day. I also feel like people want change in Illinois and want to vote this year. I think that people don’t think the midterm elections are important so they don’t vote. Many people don’t realize the importance of voting in these elections, and they only think the presidential elections are important. As critical as the 2014 midterm elections are, I don’t expect there to be a significant jump in the national turnout. It may go up slightly, but I don’t see it being anything dramatic. I think that there are multiple reasons that not as many people turn up for midterm elections as presidential elections. First many people in this country think that the president is much more powerful than he/she actually is and therefore think that voting for the presidential election is enough. Another reason that midterm election turnouts may be so low is that people don’t pay attention so they don’t know when midterm elections are happening or who is even running. I think that this year that national turnout will be around 45%. I feel that there are two main reasons that voter turnout for midterms are lower. Presidential elections tend to be more advertised, whether on TV, the Internet or in newspapers. People are more aware that Presidential election is occurring. The second reason is that people feel midterm elections for state government may not be as important as the election for President. Not many people care about who is in the senate of house of representative. Their may be a bigger turn out for governor elections but not by much. Their is more commotion over presidential elections because it is heavily publicized and you are voting for the person who will be making all the big decisions over the country for the next 4 years. i predict the turn out for this midterm election will be in the lower 40%. The reason I don’t vote is because I feel that they all lie. They are looking to help out people they know. Most of them don’t do anything for the people they represent they are looking out for themselves. Then we have people that don’t know what they support and what they don’t support. Then we have people that are to hard headed or religious and won’t change there old fashion values. People have to learn to go with the flow and help represent the people. Voter turnout in non-Presidential elections has stayed in lower perstanages for various reasons. One of the reasons may be that non-Presidential elections are simply not publicized well enough. Periodically publicizing these elections on various news channels, radio stations and on the internet would improve voter percentages drastically. Honestly, if I did not attend this class I would have absolutely no idea about this election. Therefore, I believe that non-Presidential elections are definatly not publicized as well as Presidential elections are. Thus, American citizens do not find importance in such elections. This years election will be ranked 40% as well as for the next upcoming elections unless, they get publicized as well as Presidential elections do. I believe the voter turn out is always lower in the midterm election because people are not as informed as to what they are voting for. People may know that the major elections will elect the president and everyone know what the presidents job is and how important it is. I am not sure that everyone knows what the people that are elected for the midterm will be doing. There jobs are not as clear and so people may not find them as important. I believe the election will be ranked at the most at 41%. It seems most of the people that vote during the midterms are older so it is important to inform the younger generations of what they would be voting for. I believe the midterm election is always lower because a lot of the races going on don’t mean much to the people. Obviously, people are going to be more worried about the presidential election compared to a senate seat or a house of representative position. Also, the publications for the non presidential elections are very limited so people aren’t even really aware whose running. I believe the Presidential elections hold more weight and are much more publicized for a longer period of time. It is talked about and followed by not only only the United States but people from all over the world. It’s sad that all these years, people in our respective states still can not relate to or feel educated enough about individuals running for Senate that the turn out would be in greater numbers. The candidates don’t make their presence known in the community until what feels like minutes before the election. Media adds for people we’ve never heard of until a few weeks before the elections simply aren’t enough to make them household names and get the citizens votes. I think there are many reasons as to why the voter turnout is so low. One of the main reasons is probably because more people pay attention to Presidential elections then they do the midterm elections. I also feel like more of the younger voting percentage doesn’t even know this is going on because it is not as much in the media as the Presidential election is. Lastly, I think people care more about the Presidential election than they do the midterms because frankly it is just more important. I believe that the non-Presidential voter election turnout is low because not many people follow politics closely. When elections, such as the Presidential election, are happening, they are constantly televised. Even though there are campaign ads for non-Presidential elections, not as much media is drawn to them. Therefore, not as many people know what is going on in the political world. Also, more people have a greater interest in Presidential elections because that election has a large impact on our nation. It not only effects the current citizens, but can also impact future generations to come. I don’t believe that this year’s midterm election will have any greater turnout than in the previous years. I think it’s so low because no one pays attention to midterm elections. It could also be because they don’t think it matters all that much or that they just don’t know it’s going on and aren’t well informed on what’s going on. Presidential elections are more televised and to a lot of people more important unlike with midterm elections. I don’t think the turnout for this year is going to be any greater. I actually think it’s going to go down. 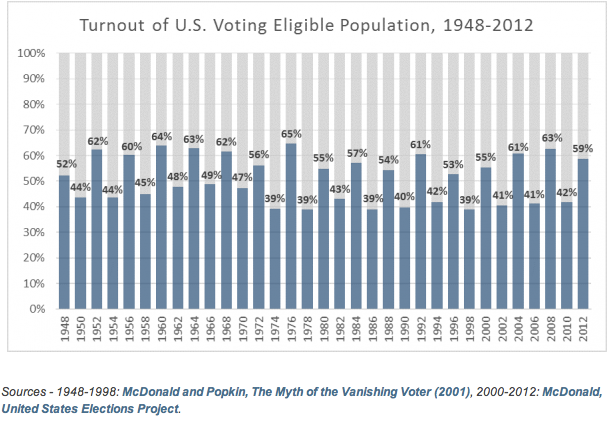 Voter turnout in midterm elections is low for various reasons. First of all, people do not recognize the great significance of midterm elections. They generally consider presidential elections to be of greater importance, which is true to a certain extent. But, they are unaware that midterm elections are equally important as presidential elections since they impact their lives more directly and on a more personal level. In addition to that, midterm elections are not given as much media coverage nor publicity and attention therefore people are unaware that there are elections occurring or they conjecture that they are not as important since they are not given full media coverage. Or, they simply believe their vote will not make a difference or in Illinois’s case, people believe the candidates are all corrupt. Also, people have a greater interest in presidential elections thus causing higher turnout rates because people believe that presidential elections will bring change but actually they are unaware that change starts from the grassroots like the Senate and House of Representatives. Voter turnout will generally be approximately the same this year except for states with gubernatorial elections. States with gubernatorial elections will have around 45 to 50% voter turnout rates and will be slightly more larger than states with just midterm elections. I think the reason non-Presidential elections are low because I feel like people are really not engaged to who run the Senate and the House. My other reasoning is that I feel like its really not advertised that well to the public. Furthermore, I think people just don’t care all they want to know is who is going to run for President. I think in order to get these ratings high the media needs to put the ads on television more frequently instead of just hanging signs outside saying who to vote for. I think this years rating it will be around 40% because I really don’t think the media did well enough on advertising who’s running so the public is not going to care. I personally never knew what the midterm elections were until taking this class. And if the rest of America is as unintelligent and uniformed as I was, they don’t have too much information on this matter. Having said that I don’t think many people understand the concept of Midterm elections. I think there will be another percentage drop. With all the headlines of Ebola, Isis, and other terrifying things, I think many Americans have more to focus on. I feel like voters only care about the Presidential elections because they think that’s the only one that’s important. That, of course, is completely false. I think a lot of people think the President is the most influential man in the country and therefore that’s the only race that they need to participate in, but in reality, some of these smaller elections are just as important to vote in. If the President was the only one that mattered, why would we have posts such as Governor and Senate available? We wouldn’t. I think the voting will remain similar to years before this year. I believe that voter turnout is lower for midterm elections because people are not as interested as they are during presidential election years. Many people of voting age probably don’t even know what types of elections are happening in their state. I also think that the turnout this year will remain stagnant with a slight chance of increase because of some states allowing voters to show up at a ballot box with an i.d. and not having to register. The mid-term votes are comparably lower for a few reasons. One inference would be that people do not as involved in politics overall during non-presidential elections, perhaps they are unaware or uneducated about what the judges, senators, sheriffs, aldermans etc ideology are. Also 1974 seems to be a meridian and separates higher voting participation. Perhaps it was because of the intense civil rights movement and the counter culture of the 60’s that produced high voter turns out and perhaps it was the Vietnam War and the institute of the draft (’69) that led to a trend of low voting percentage due to mistrust/dislike in the government. i think the reaosn why the percentage is low is because no one sees the importants of a midterm election. People only think presidential elections are most important because they have more of an impact. Presidental elections are more important than senate and other races. Presidential elections are more in the media than any other election.i think the numbers will either stay the same or go down. i think this because our generation is not into politics as other generations were. I think that the reason the voting percentage is so low is because people are not as interested in the mid term elections, as they are in the presidential ones. People are more concerned about who is going to run our entire country, rather than the other positions involved in the government. I think that this year the mid term polls might jump up a little higher than the usual amount because people want to elect government officials who will help to better our communities and also because the younger group of voters seem to be more interested in politics. The voting midterm seems to always be low. Not that people don’t care about the election, but people usually only care about the end result and this is only preliminary. The midterm is publicized like the last two weeks of any election like you said in class, the majority of voters do not pay attention until then. It is critical that U.S. citizens vote in every single election and not just those taking place in presidential election years. However, I believe that many of us choose not to vote simply because of our false belief that the non-presidential elections do not matter as much as the presidential election. Now just from glancing at the table shown above, the pattern is obvious. The turnout will fall just as it does every midterm election.